This site will live on in our memories, even as we move on to bigger and better things. The few of you who attend my class AND read my blog have realized by now that, as usual, my brain underwent a shift this summer. “Shift” is a euphemism, perhaps, for that which has happened to my little grey cells. Not meaning to be obtuse, perhaps the most accurate way I can describe this so-called shift is to say that my brain, in seeking foreign presences and expanding beyond its accustomed cognitive limits, has disseminated, dissipated expansively, spread itself out to roughly the consistency and intensity of the lingering smell of fish frying, two weeks later. If you’ve ever lived next door to fish-fryers, you know what I mean. I apologize, but it’s the new way I am. I can’t control it and it defies the standard form of documentation suggested by this particular forum. And so, sadly for some, I will no longer be describing in writing the daily activities of this class on this blog. A programmer/designer friend of mine tells me he links potential clients to this blog to give them a sense for how different “voices” in writing can give a site different kinds of tone and mood. I guess I’m pleased my multiple personality disorder could come in handy. To someone. My wife links our friends and family to this blog so they can at least confirm my continuing existence on the planet. I’m not a very good correspondent. I do try to send messages with my brain to these people from time to time, but… they’re busy. Various kind and ambitious teachers and teachers of teachers have linked to this blog as an example of how technology can be used to enhance classroom instruction. I’m sorry to you all. You’ve been duped: This is not a school blog–it’s actually a playground. Awesome local bands have linked to this site in the hope that some of the glorious flakes of inspiration might be brushed off of my shoulders onto their eager heads. They would also like me to mention that there is an epidemic of bears fighting sharks going on in nature right now. Why, why oh nature, art thou so cruel? And what can we non-nature humans do to help? I propose a telethon/shopping spree. Anyway, it is in this celebratory/mournful spirit that I announce the death of daily written updates to this site and the imminent arrival of the new East Hollywood Cyber English Podcast. That’s right, I’ll be cherry picking the finest, stand-n-delivirenest moments of my day, heavily editing out the inappropriate content and student rebellion, and making it available to the disinterested public and the theoretical conscientious student, in an easy-to-download, even-easier-to-listen-to audio format. Coming soon: The voice behind the voice. Posted in my face--it burns! Welcome to the computer lab. Be nice to the sub. Your work for the day consists of creating three complete outlines, each of which could be expanded into a complete essay. Because I order you to do it, by the authority vested in me by the administration, your parents, and the state, and you must comply. Also, If you are able to write a well-structured essay, even if many of the other aspects of your writing are very poor, you will still probably pass the test. Having gone through many of these tests, and examined the grading procedures, there’s nothing that will earn you more points than a strong structure and well-developed ideas. Open up this word processing document: Outline practice worksheet. It contains three questions and outline “skeletons” ready for you to fill in the blanks. The first two questions, you can answer from knowledge and experience you already have. Make up evidence and examples if you want to. On the last question, you’ll need to read this article first (link), gather information and evidence, and then outline your answer to the question. We practiced this in class with the article about Nine Inch Nails. If you paid attention, it should be pretty easy. REMINDER: When you fill in the blanks in the outline, just include brief notes, not whole sentences or paragraphs. You just need enough information to remember what you wanted to say. That’s it! Finish it, print it, hand it in on Friday in class for big points. If you finish early, please be respectful of the others in the class still working. We’ve also started reading Alice’s Adventures in Wonderland. As we read we’re trying to see if our ideas about logic and reasoning help us understand what the hell(ck) Charles Dodgson was thinking when he wrote this. I really hope they do because I haven’t read this book since I was 10, so I’m not really sure if there’s anything in it of actual educational value. But people say there is, and I definitely trust people! Think of something you need or want and a person or organization that can get you that thing. Write a business-type letter (or email) to that person or organization laying out a formal argument why they should do this thing for you. Outline your argument by writing down your basic premises and conclusion. (The conclusion to your paper is easy: “Therefore, you should give me X.”) Make sure that the argument follows logically from one premise to the next, and think about how you can convince the reader that each premise is true. Show your premises and conclusion to Matt before you proceed. Each premise you wrote down on your argument outline will need its own paragraph to support the premise and provide convincing evidence that each of your premises is true. This “evidence” can take the form of examples, hypotheticals, logical reasoning, etc. Include whatever evidence your particular audience will find most convincing. Your rough draft is due Monday, April 21. Let’s analyze. What’s strange about these two pictures? Well, I will be danged, you’re right! 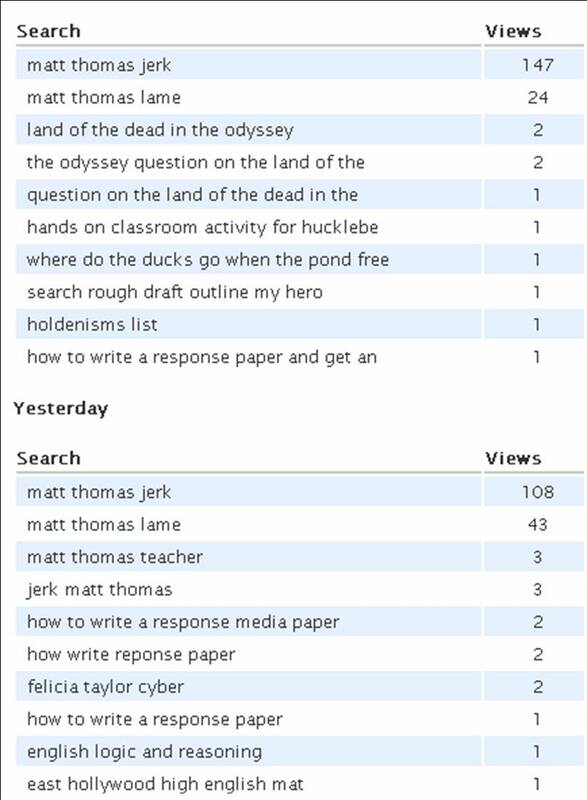 I’ve been Google-bombed by a duck enthusiast! A duck enthusiast named Carter G. Miller, Esq., to be specific. Sir, I salute, you, and I hope you have discovered the answer to your burning question.